Bridge Goth is a American 30 year old bridge player from Oklahoma who has played on professional teams as well as taught bridge professionally. 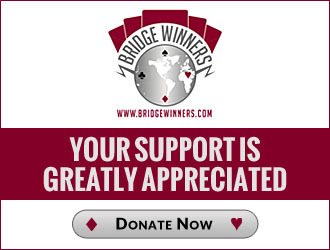 Through the years as a bridge player he found that had a huge library of hilarious stories that he would like to share with the world about the game of bridge. He also loves to answer bridge questions and help other people out who are looking to improve their game. He has written his own bidding system called The Finnish Club which has been proven successful in tournament play. He is one of the few in the world to be fully versed in the world famous "Fantunes" system. Later he was able to combine to 2 systems and create the highly effective "Finntunes" system, which corrects the many flaws of Fantunes. Inventor of: Mylläri, Skipbo, Turunenbo, 5LTFmA2NT, Nightwish, Jansen, as well as the Finntunes system. More information about these provided upon request. What do you play over 1N (2♦), 1 Major? The Longest Consecutive Chain of Bids Ever?